Wrexham woman scores victory over hair loss thanks to netball | News by Wales Express News, People Before Profit! A sales assistant has overcome the devastating effects of losing her hair because of alopecia – thanks to her love of netball. Gemma Nelson from Next at Eagles Meadow, Wrexham is a netball coach who coaches at a high level and is working with international team in Holland. 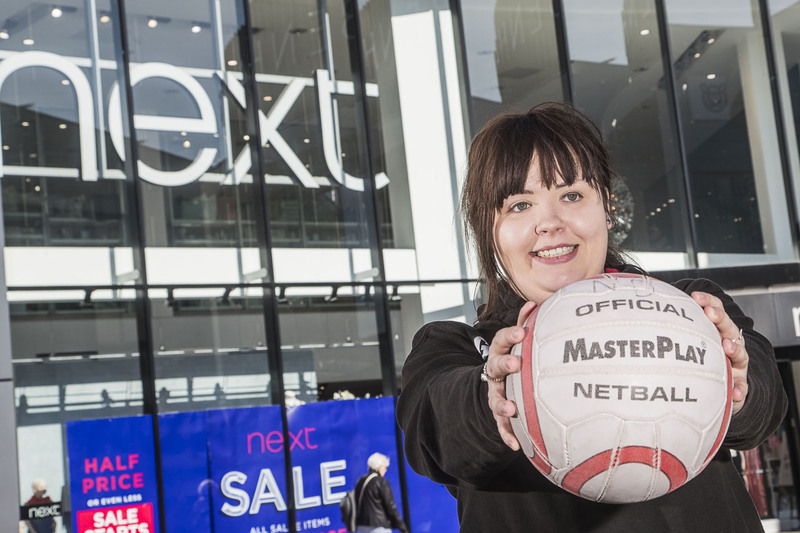 Gemma Nelson, 22, who works at the Next store at the Eagles Meadow Shopping Centre in Wrexham, is now a Level 2 netball coach and helps run one of North Wales’ biggest clubs. As a 16 year-old she had to cope with alopecia which made life difficult for the teenager who was conscious of her looks. But six years on and with her hair growing back, Gemma says netball and getting involved in the Glyndwr University-based North Dragons Netball Club has been her salvation. She said: “My alopecia started when I was 15. My hair wasn’t growing and started falling out in big lumps and I was diagnosed by my doctor as having alopecia. The condition can be caused by stress but mine was down to my immune system. “Basically my body began attacking my hair and that caused the hair loss. My hair began to grow back for a while and then when I was 16 it all fell out, everything including my eye lashes and eye brows. “It was tough but in fairness school wasn’t an issue as everyone was really supportive, there was no bullying. The big issue was walking down the street and people staring, I found that quite difficult. “There is no real treatment for alopecia. I wore wigs and most people didn’t notice. But I decided to stop wearing a wig and that’s when my confidence grew back too. Gemma, who was born in Germany as her dad was in the army, studied sports coaching at Glyndwr University and that’s where her love of netball really took hold. She said: “I’ve lived all over the place as dad was in the army. We lived in Chatham, Oxford and Cambridge at different times. I did play netball at school and when I arrived at Glyndwr University I went for trials for the netball team. “My friend, Beccy Roberts, has set up the North Dragons Netball Club based at the university and asked me whether I wanted to get involved as she could do with another pair of hands. “I got a place in the university’s second team and began helping Beccy with the club in 2012. The problem is the club has just expanded and expanded! I slowly took my coaching badges. “I did my Level 1 coaching badge with Glyndwr University’s development officer and then my Level 2 which means I can run my own club if I want to. I’d like to do the Level 3 but that would be very expensive to be honest. Gemma, who lives in Wrexham, is jetting off to the Netherlands with England Netball to help coach British girls taking part in a tour. She said: “It’s a master class tour and I’ll be helping coach youngsters from all over Britain who are taking part. I just really enjoy coaching, especially our club girls. I enjoy helping them reach their full potential whatever their age. “There is no doubt netball has really helped me get over the problems of alopecia. I feel I can be myself and have lots more confidence. I work 21 hours a week at Next and spend the rest of my time coaching netball, I just love it. “The team at the Eagles Meadow Next store have been so supportive of my coaching and have helped me a lot. The manager is wonderful and very accommodating if I need to change shifts because of a tournament. It’s a great store team. Eagles Meadow manager Kevin Critchley congratulated Gemma on attaining her netball coaching badges and for her work with North Dragons Netball Club. He said: “It’s fabulous Gemma has turned to a sport she is clearly passionate about to help her get over her problems with alopecia. And it’s wonderful she is putting so much back into the community through her work with North Dragons Netball Club. To find out more about North Dragons Netball Club check out their Facebook page.